Our 403 Microfibers and 405 Filleting Blend are excellent structural fillers but they’re fibrous and leave a rough surface when used to make fillets. To end up with a surface that is ready for coating or re-bonding without having to remove amine blush or sand smooth, apply a narrow strip of 879 Release Fabric after the fillet is made. 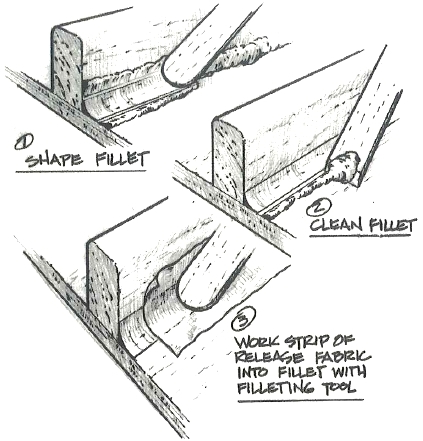 For best results, apply the fillet and clean excess epoxy away from its edges. Lay the strip of release fabric over the fillet and with the same application tool that was used to apply the fillet, use gentle pressure to work the release fabric into the epoxy. Leave a tab of release fabric as a hand-hold for easy removal. After the epoxy has cured hard, peel away the release fabric. There is no amine blush to wash away and the textured surface left by the release fabric will allow immediate re-coating. This procedure can be used for other applications such as smoothing out composite chines and keels in stitch and glue construction and applying over fiberglass cloth in areas where secondary bonding is planned.